1. Have you ever been forced by your parents to wear a hideous jumper when you were seven years old and a gown that made you look like a giant cake on your 18th debut? -- Come to think of it, you didn't even want a debut! 2. Have you been schooled in a Catholic girl school and up until now you don't know the reason why you got a verbal warning for not wearing your skirt 2 inches below the knee? Then after high school, have you gone to College and was given ANOTHER verbal warning because you were charged for showing some skin? When in fact you only bent down to pick up your ball pen and your shirt went up, accidentally in doing so? 3. Are you nearing 30 years old and your parents still want to know your whereabouts and want you home before 12 midnight? 4. And now you are getting married, and you don't understand why your best friend of 20 years can't be your maid-of-honor because the supposed rules say your maid-of-honor can't be married or should be a relative? So your closest friend in the world is demoted to a Bible reader!?! 5. And now you have a beef with your mom because you want to wear a blue pair of Louboutins underneath your gown and it's making your mom cry because she doesn't understand why her daughter doesn't want to wear a white pair of shoes and she thinks you are going to burn in hell? Then you look up to the heavens, a'la Nora Aunor in Himala, and say: WTF?!?!?!?!? If you can relate to these experiences, one way or another, then this blog is for you. Don't get me wrong, it's not that I don't believe in discipline and values but to me, there is something seriously wrong if you are about to be a wife and a mother and you are still being forced on what to do. Being in this culture dictates for the parents and the relatives, AND the church to be super involved in the wedding...with traditions and rules that for some reason, keeps changing and evolving up until now! And don't even get me started on cookie-cutter wedding magazines, who sugar-coat weddings and make you believe that you are a certain bride. I don't mean to belittle tradition and classic brides. Don't get mad. But if you are a traditional bride, then good for you--you have a LOT of references and support to get you through your wedding. But if you are a rebellious bride, you probably will even have a debate or two with your own friends and you'll have a harder time looking for ideas to help with your wedding planning. So this blog is really for the bride who needs to be empowered and be inspired to unleash the rebellious bride in you. Whether it's as simple as wearing a quirky gown or as serious as not having a church ceremony, this is for you. Because there's not enough local wedding blogs or magazines out there that will genuinely support your decisions without the judgmental eyes. Wow finally!!! First of all, I just wanna say how much i love your site. PS. 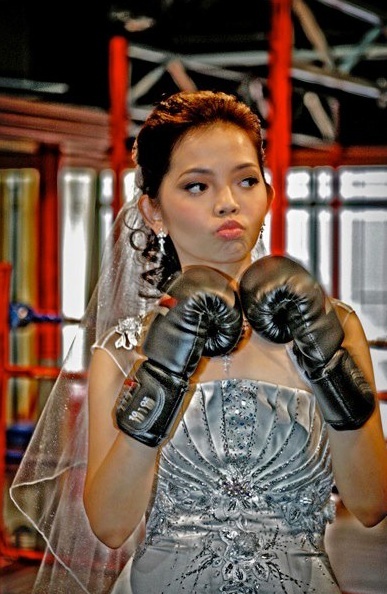 Ever since I discovered this blog, this has been my survival guide for our upcoming wedding. First thing, I just want to say that I just discovered this blog and already I'm loving it! I consider myself to be a traditional, conservative person.I was aware that weddings come with traditions and restrictions. But when I got engaged early this year I realized, grabe! Ang dami palang mas conservative pa sa akin. Some of the traditions I agree with and I'm planning to follow, but others I think are way out of line. My friends and family keep mocking at our ideas but this blog proves there are people like me and h2b! P.S. My rebellious decisions so far: bought my wedding gown at the mall, not having a big cake since it scares me, no torch or sword parade and no innocent little doves . Our wedding is on December 2012. We're planning to have it at Fernwood Garden since I've always wanted a garden wedding and it fits our theme---- A Midsummer Night's Dream. Fernwood is definitely traditional. Apparently, they also offer a carriage ride for the bride to arrive in. This I have refused. I'm coming in, in a tricycle = D As an overseas bride, I don't get to ride tricycles and it reminds me of fond memories from childhood. Would love to help? Nabasa mo ba ang mga references sa St. Paul dito? Hahahahah! Needless to say, I think your blog is awesome! Thanks for making me feel I'm not alone in wanting different and better things for my wedding. I hope you continue to inspire brides-to-be (and their grooms) to make the most important day of their lives, truly theirs to own & remember. I don't know how I stumbled upon this site but I'm so glad I did! I'm a bride-to-be, and after reading a few posts here, I finally understand why I'm having such a hard time going through the wedding process especially when it comes to dealing with the parents. I'm just so sick and tired of hearing the wedding-is-just-a-once-in-a-lifetime-event-so-make-it-bongga crap. I don't want a bonggang wedding. I don't want a big church. I don't want a sweetheart neckline tube gown with a 10-kilometer train. I wish that the society would just shut up and give this one freaking day to the bride and groom. And dear parents, please stop imposing what you've imagined your son's or daughter's wedding to be. You've had your once-in-a-lifetime a long time ago and it's not our fault if it didn't turn out the way you would've wanted it to. Go renew your wedding vows or something. I just came across your blog today (after Google-ing about Jolina's wedding dress...which led me to your blog), and I love it! I guess it's because I'm somewhat a rebellious bride too. It's way more fun and memorable to have lots of unexpected stuff in your wedding, than have the super traditional typical boring one. Thankfully, my mum's sort-of used to my weird ways already, so she did not object to me wearing colored shoes under my big white dress, and as an added twist, I had pink shoes and flowers at the wedding, then switched to blue shoes and flowers at the reception(see http://mareeyah.com/blog/bouquets-and-shoes/), as a nod to the last scene in Sleeping Beauty where the fairies kept on changing the color of Aurora's dress to pink/blue. Hi Mareeyah! Even your name sounds like a rebellious version of Maria ;) Hehe. Thank you so much for the nice words and we're glad to find a kindred spirit in the form of a rebellious bride. Thanks also for sharing with us your rebellious wedding twist! Who says you can't have two colors, two shoes and two bouquets, right? :) Enjoy reading our blog!